The theatre, amphitheatre, circus and hippodrome have their seating of the spectators in a half-round, round, oval or in an elongated way in common. The geometrical layout, combined with their recreational purposes, brings this particular type of building for mass-entertainment to the attention of quadralectic architecture. The theatre in Epidaurus (Greece), dating from around 360 BC, can be seen as the prototype in the Greek architecture (fig. 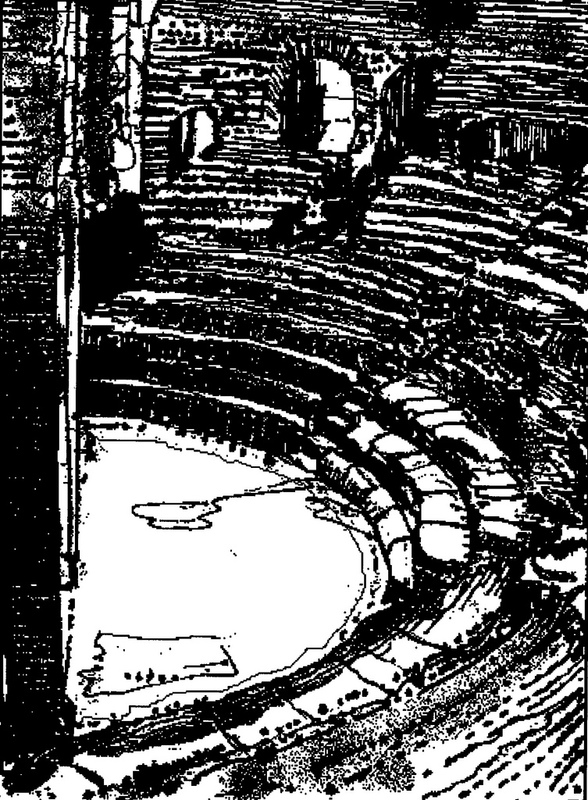 323), which provided the inspiration for similar Roman theatres (fig. 324). Fig. 323 – The round seating (cavea) in the theatre of Epidaurus (Greece) was designed by Polykleitos the Younger in the fourth century BC. It has since been an archetypal way to focus the attention of a large number of spectators to a central stage (scena). Fig. 324 – The well-preserved Roman theatre in Benevento (Campania, Italy) was built by Emperor Hadrian (117 – 138) and expanded by Caracalla (211 – 217). The diameter was ninety meters and the venue had a capacity of ten thousand spectators. The city of Benevento (Beneventum), situated on the Via Traiana, also harbors a triumphal arch in honor of Trajan, which was erected in 114 AD. 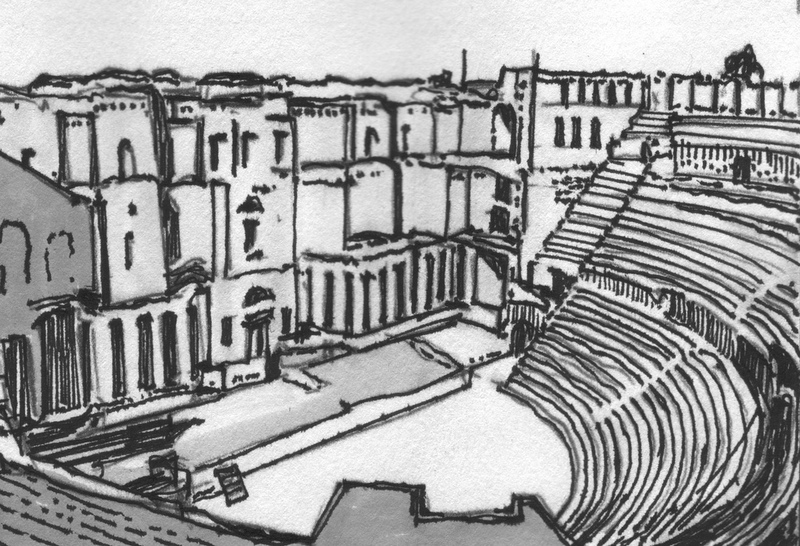 The layout of the ’classical’ (Greek) theatre, which was usually half-circular, consisted of three main features: the cavea (seats), the orchestra (area before the stage) and the scena (stage). The stage in Greek theaters was open, offering a view to the landscape. The Roman theatres often featured an edificio scenico at the back of the scena, making the space more enclosed. The South Theatre of the city of Jerash (Gerasa, Jordan) was built in the first century AD and could hold some five thousand spectators. 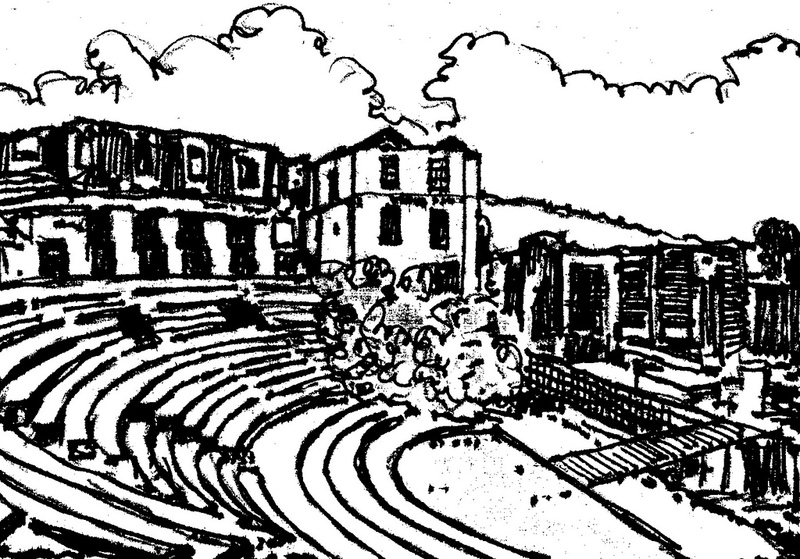 The drawings of Iain BROWNING (1982) gave an impression of the elaborate and monumental architecture of the ‘scena frons’ of the South Theatre (fig. 325). The building was part of an extended complex of public buildings, like the hippodrome, the Roman Forum, the tetrapylon, thermen and the temples of Artemis and Zeus. The North Theatre is smaller and probably used for gladiator fights. The Roman emperor Hadrian visited the city in the winter of 129 – 130 AD and erected a triumphal arch as part of a proposed city wall. The connection between the arch and the wall never materialized. Browning’s book, with its marvelous drawings of the various buildings in Jerash, is a delight to study and helpful for every visitor of the ruined city. The city of Jerash was part of the Decapolis, a region to the eastern site of the Sea of Galilea. Ten cities of Greek-Hellenistic origin formed a loose bond in an otherwise Semitic environment. The cities had a degree of autonomy and were ruled along the ideas of the Greek polis and later took advantage of the Roman culture, in particular in architecture. Fig. 325 – This reconstruction of the scaenae frons of the South Theatre of Jerash (Jordan) by Iain Browning (1982) indicate the closed character of the Roman theaters. 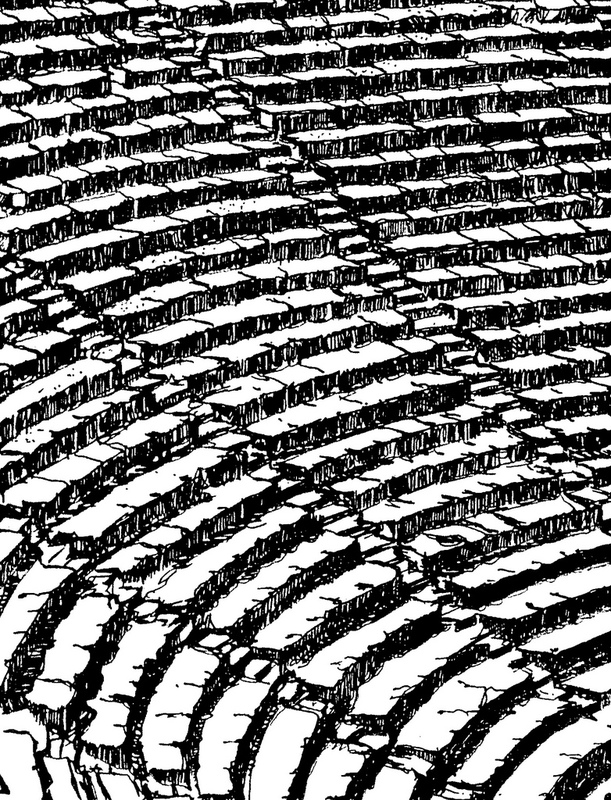 The word amphitheatre is derived from the Greek language and points to the all-around nature of the ground plan of the (open) building with a central stage. The public could observe the spectacle, games or displays from all sites. A further distinction in form and function of theatrical buildings can be made for the Greek hippodrome or the Roman circus. They were mainly used for horse- and chariot racing. The plan of these stadiums was more elongated to accommodate the race course (although ‘circus’ refers to a circle). The arena pointed to the sand, which covered the floors during the fights with animals or between gladiators. The term arena became in due course the name for the public building-as-a-whole. Finally, there was the odeon, a kind of half-circle theatre in ancient Greece, which was smaller than the dramatic theatre and sometimes roofed over. It was used for theatrical plays and musical performances. The Odeon of Herodes Atticus, at the south-western end of the Acropolis of Athens, is a good example, although unusual large. The structure was built in 161 AD and has a diameter of eighty meters. The capacity was around five thousand people. 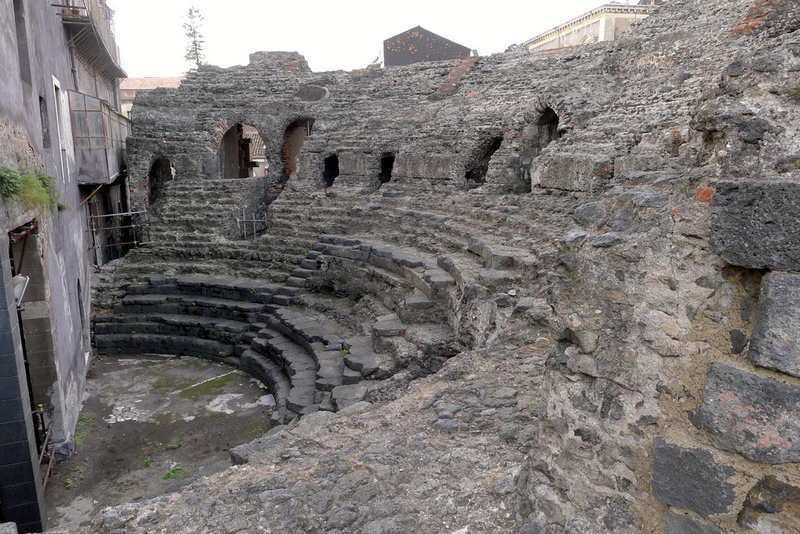 The Odeon in Catania (Sicily) dates from the third century AD. (fig. 326). Fig. 326 – The Odeon in Catania (Sicily, Italy) is a small theatre, like there were so many built by the Romans during the pinnacle of their cultural presence around the Mediterranean. The town of Toarmina (Sicily) has a similar Odeon, situated in the middle of the polis. It is much smaller than the nearby Teatro Greco, an amphitheatre originally built by the Greek in the third century BC, when the town was called Tauromenium. The Romans altered the layout in the second century BC to suit their taste for violent entertainment. Gladiator fights replaced the theatrical display of spoken word and music. This change in emphasis from the peaceful (poetry and music) to the powerful (violent games) is a marker point in Roman history. A third expansion to the amphitheatre took place in the second century AD, and brought the diameter to 109 meters. The amphitheatre was at that time the second largest of its kind in Sicily. The Flavian theatre in Rome became known as the Colosseum, because a thirty-seven meter high statue of Nero (the Colossus Neronis) was moved during the reign of emperor Hadrian from the Domus Aurea to a place in front of the Amphitheatrum Flavium. 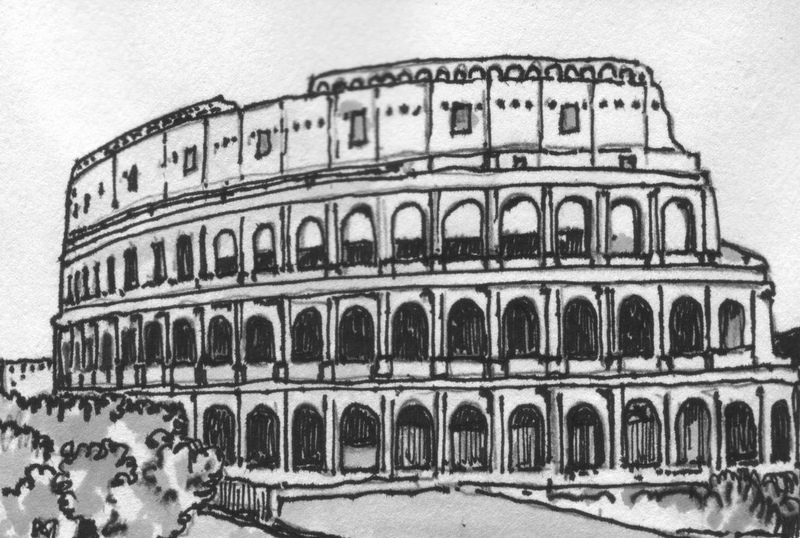 The Colosseum has four stories (fig. 327), but it is unlikely that a four-fold idea was present during the design around 70 AD under Emperor Vespasian, since the fourth story was only added in 230 AD. The bottom three stories – as part of the original design – have each eighty columns and eighty arches. The stories are separated by thin architraves. The arches on the bottom story are separated by Doric columns (plain) and are engaged (shaft is part of the wall). 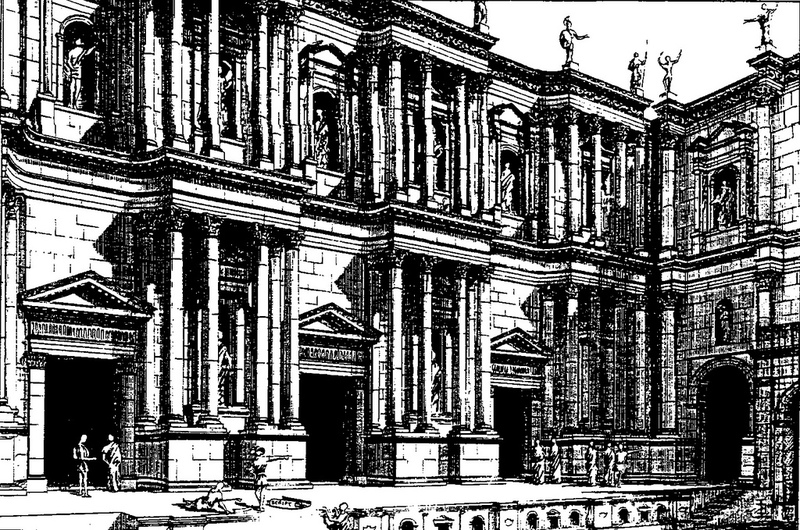 The second story has engaged Ionic columns (fluted and tapered) and the third story has Corinthian columns (ornate). The fourth story consists of a solid wall with Corinthian pilasters. The space between the pilasters was originally filled with forty rectangular windows. Most of the prominent amphitheatres were built in the Late Antiquity (1 – 2nd century AD). The Colosseum in Rome might be its highlight, but is in size closely followed by the amphitheatres in Verona (built around 30 AD during the last years of the emperor Augustus) and the first-century AD Amphitheatre Campano in Sancta Maria Capua Vetere. The amphitheatres spread over the Roman Empire and became, just like the bath complexes, the symbol of successful Roman citizenship. Some of the better-known examples of this particular type of public buildings can be found in Trier (Germany), Aosta (Switzerland), Plovdiv (Bulgaria), Pula (Croatia), Nimes, Arles (France), El Djem (Tunesia) and Damascus (Syria). A magnificent example of a Roman theatre was built in Bosra (Syria) with fifteen thousand seats and a stage of forty-five meters in length and eight meters in depth (fig. 328). The theater dated from the beginning of the second century AD. Fig. 328 – The amphitheater of Bosra (Syria) is one of the best-preserved examples of its kind, dating from the second century AD. It is part of a great number of similar amphitheatres, which were built during that time all over the Roman Empire. Emperor Trajan (c. 53 – 117), who created the Roman province of Arabia, lend his name to the major road to the fertile land, the Via Nova Trajana. His reign, from 98 – 117 AD, was one of the most creative and productive periods in the Roman Empire as seen from a materialistic and architectonic point of view. The Circus had a different function as the (amphi)theatre and was geared towards (horse)races (NELIS-CLÉMENT & RODDAZ, 2008). The name ‘circus’ pointed to the cyclic movement of the horses. They ran sometimes four, but usually seven rounds. The Circus Maximus qualifies as the oldest and largest circus in Rome, stretching between the Aventine and Palatine hill. The circus in Lepcis Magna (Libya) is probably the best preserved and studied (HUMPHREY, 1986). By the time of Emperor Augustus there was a complete building with starting gates (‘carceres’), stands, turning posts (with the eggs or dolphins to count the rounds) and the imperial enclosure. Four racing groups (stables) were known as factions (‘factiones circi’ or ‘factiones quadrigariorum’) and were indicated by colors: the Red, White, Blue and Green. People (the ‘comitia’ or mob) choose a particular color to support or bet on the various quadrigas. 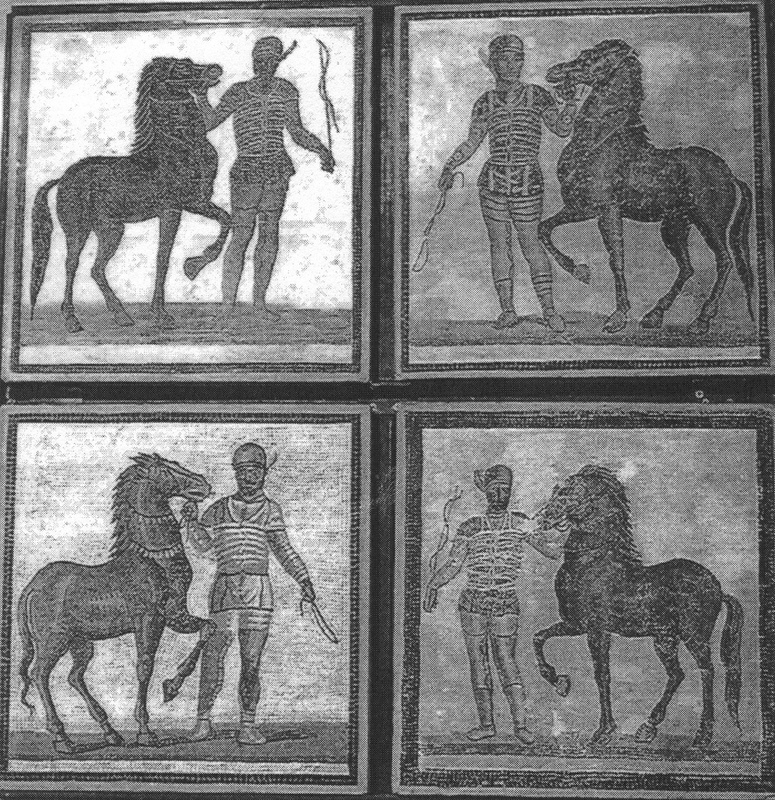 Mosaics in the Palazzo Massimo in Rome gives a display of the horses and their attendants of the four different stables (fig. 329). The mosaics dated from the third century AD. The Palazzo Massimo is an urban Renaissance palace in Rome, which was built by Baldassare Peruzzi between 1532 – 1536. It stands on the stadium (odeon) of emperor Domitian. Fig. 329 – These mosaics, kept in the Palazzo Massimo alle Colonne in Rome, are from the third century AD. The horses and their attendants belong to the factions Red, White, Blue and Green. Their importance as social groups varied in place and time. The various ornamental units on the spina are interesting as architectonic elements. They were placed along the central barrier following strict rules. The tropaeum (victory sign, trophy), a bull, an Egyptian obelisk and a statue of Cybele with lions (VERMASEREN, 1977), a statue of Athena Promachos and three cone-shaped poles, the metae, had their own designated place in the middle of the track (fig. 330). Furthermore, the earlier-mentioned dolphins or eggs, to count the rounds of the quadrigas, had their place in the central part of the track and were visible to all spectators. Fig. 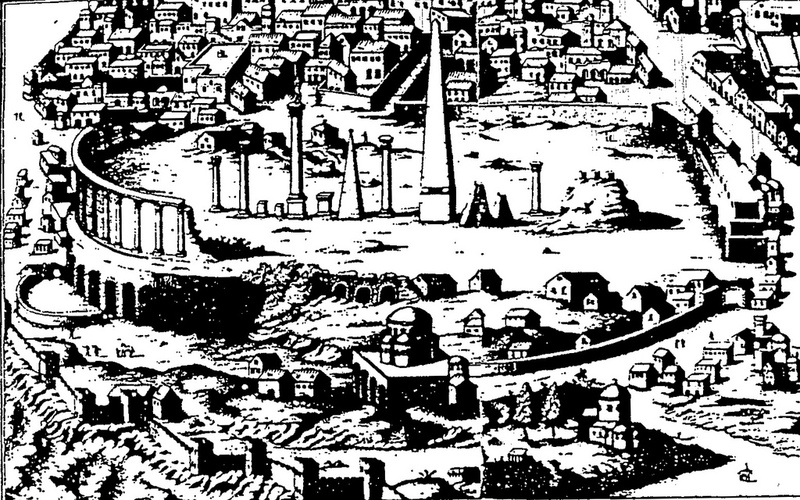 330 – This illustration of the hippodrome in Constantinople is given by Onufrio Panvinio (1530 – 1568). It shows the spina, the central area of the racecourse, with its various ornaments. The French Benedictine scholar Bernard de Montfaucon (1655 – 1740) used a (slightly different) picture in his monumental book ‘L’antiquité expliquée et représentée en figures’ (1719). The history of chariot racing, with its classical Greek, Roman and Byzantine ramifications, was permeated by four-fold symbolism. However, its actual importance as representatives of a four fold way of thinking is harder to judge. The boundary between intention and numerological coincidence is very thin in this occasion. The number of horses in front of the chariot could be either practical, like the Egyptian pharaohs, who used to hunt in a biga – a carriage drawn by two horses – or psychological, when four horses were used in a quadriga and the power aspect comes into the picture (and a reference to the four corners of the world). The same interpretative uncertainty holds for the number of factions. The presence and importance of the various groups had an unequal distribution in time and place. The Red (or russata) and the White (albata) were the major factions in the early days of horse racing in Rome, while the Blue (venata) faction was only mentioned from the time of Augustus onwards. The Green faction (prasina) was first recorded during the reign of Emperor Caligula (37 – 41 AD) (VIGNERON, 1968). The situation was again different in Byzantium, where the spectacle of chariot racing became a popular pastime for the crowd some two centuries later. The Blue and Green were the most important factions in Byzantium, with the Red and White as minority groups (MARICQ, 1950; CAMERON, 1973/1976). The idea of four equal parties in competition never existed. WEITZMANN (1979) remarked that ‘the imagery of the four circus factions was conventionally understood as a reference to the four seasons and the perpetual renewal of nature’s bounty’. However, it is fair to assume that much of this symbolism was ‘planted’ in the phenomenon at a fairly late stage of the Roman cultural history (or even in more recent times of the European cultural history). The Babylonian roots of the quadriga supplied the symbolism of the sun-god to the historical relevance of the feature. The Greek culture took over this metaphor of power somewhere between the Mycenaean and Archaic style period (HAFNER, 1938). The Greek names of the four horses, which pulled the chariot of the sun god (Helios), were respectively Pyroeis (Fiery), Eoos (Dawn), Aithon (Flash) and Phlegon (Blaze) (MATZ, 1995). Gods like Nike, Athena, Heracles, Hera and Hades were depicted as occupants of a quadriga. The Louvre Museum in Paris possesses a mosaic of the sea-god Neptune (and Amphitrites) in a half-sunken quadriga. Jocelyn TOYNBEE (1948) counted some four hundred-and-eighty names for racehorses in the classical literature (Greek and Latin). She pointed to Homer, who mentioned Hector’s steeds (Ilias 8, 185) as Xanthos, Podargos, Aithon and Lampos (Tawny, Swiftfoot, Flash and Fire). There is also a contorniate design (bronze medals struck in the fourth and fifth century AD – the word comes from the Italian word ‘contorno’, or ‘surround’, referring to the raised rims surrounding the coin – where the four horses are respectively named as Achilles, Sidereus, Speciosus and Dignus. Many quadrigas figure on Corinthic, Chalkidic and Attic vases and amphoras from 600 BC onwards. The city of Syracuse (Italy) was specialized in minting medallions and coins with a depiction of the quadriga. The autocratic government of Dionysios (405 – 367 BC) needed money to pay its mercenaries, mainly consisting of Celtic soldiers (Gaesatae), and the symbolism of the quadriga and the goddess Victory were favorite themes in the numismatic efforts of the government. A major contribution to the (European) interpretation of the quadriga was given in an influential medieval work by Hrabanus Maurus, a Benedictine monk who became archbishop of Mainz in Germany. He lived from c. 780 to 856. His work, called ‘De Rerum Naturis’ (On the Nature of Things, also known as ‘De Universo’), deals – in twenty-two books – with all kinds of encyclopedic knowledge. Book VIII is on animals (De Bestiis), while Book IX is concerned with astronomy and the world and the heavens. In various manuscripts (Cas. Fol. 120r; Pal. Fol. 111r) it depicts the personification of the Sun (De Sole), driving a quadriga and a personification of the Moon, steering a biga (Le BERRURIER, 1978). The Christian tradition followed the pagan interpretation of the quadriga as a vehicle of power. The scholar Maren-Sofie RØSTVIG (1970) pointed to the frontispiece of Antonius Fernandus’ book ‘Commentarii in viones Veteris Testamenti’ (London, 1617). It gave a vision of the prophet Ezekiel. The chariot is shaped like a globe and Christ is triumphant over evil and figured as a ruler of heaven and earth. The Biblical ‘quadriga of Aminadab’ (a currus with four wheels) was seen as a symbol of Christ riding through the world, bringing its message by means of the Evangelists, symbolized as the wheels (SAUER, 1924). The history of the quadriga and its associated symbolism is rich and varied, but an elaboration would lead too far away from our present subject of quadralectic architecture. Attention to the quadriga, as a sculptural unit, will be given later, dealing with the ornaments of triumphal arches in the Neo-Classical period (and thereafter) in the European cultural period. These exuberant tetradic sculptures claim a dominant place in capitals like London, Brussels, Paris, Berlin, Rome. The Narva triumphal arch in St. Petersburg (Russia; 1833) even has six horses pulling the chariot. The quadriga still reverberates a sense of competition and victory together with the notion of peace and stability. The architecture of places of leisure and public gathering has its own place within the complex of architectural history. Their ‘grand’ character, with a view to entertain the masses, includes all the elements of the various stages of visibility. The architecture of places of leisure can be contrasted to the architecture of churches and temples. The former seems to be guided by Fourth Quadrant (IV) ideas, while the latter is inspired by the mental environment of the Second Quadrant (II). 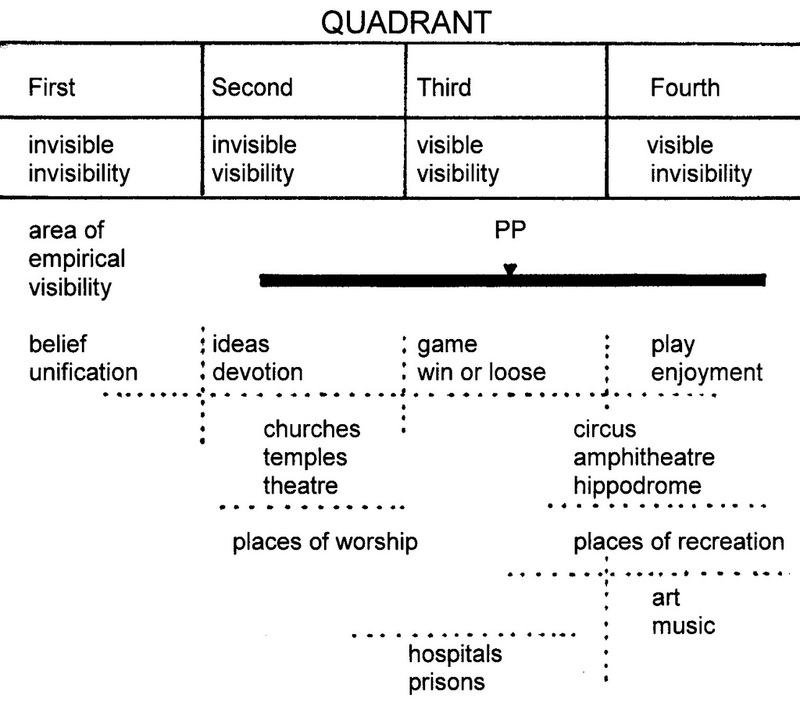 The churches and temples aim at the invisible invisibilities of the First Quadrant (I), pursuant to a collective devotion to a higher power (belief). Buildings for recreation focus their attention to visible invisibilities, like feelings of togetherness. They might even give way to some sort of trance (or mass hysteria), ending in the realm of a (new) First Quadrant. All these ways to spiritual fulfillment are embodied in the empirical visibility (III) and its expression in architectural features. The following scheme (fig. 331) is a guideline to the position of various types of buildings within the context of a quadralectic communication. It is suggested, that the initial point of origin to perform a particular architectural task will be reflected in its outcome. The same mechanism holds for ‘the way back’: any building plan has its psychological origin embedded in its visible outcome. These statements are hard to prove in the conventional way of scientific inquiry, because of its linear nature. The statement of reciprocity hardly needs discussion in a cyclic view, which is proclaimed in the quadralectic way of thinking. Fig. 331 – The suggested position of architectural features and associated artistic expressions is given here in a quadralectic framework. The dark black line marks the area of empirical visibility. The considerations of this choice are given in the resumé of the quadralectic theory in chapter 7. PP is the Pivotal Point, situated in the middle of this area. The psychological characteristics of the quadrants are given as: belief (I), ideas (II), game (III) and play (IV). Their associated intentions are respectively a unification (I), devotion (II), a win or loose situation (III) and carefree enjoyment (IV). This chapter on classical places of leisure has left many sideways open. Hopefully, it will act – as some of the earlier chapters might have done – as an inspiration for further research. This approach should be carried out in the spirit of the fourfold way of thinking, searching for the above-mentioned reciprocity. The great aim will be to trace the place of the observer and the observed within the context of a quadralectic communication and valuate the visible results (like architecture) in that context.